What do the NYC subway directions mean?! What does it mean to take the NYC subway downtown? Your answer with a quick visual explanation. Before we get into service changes, the difference between express trains/local trains, let’s cover the basics here. I swear, this part is easy. The rest is where it goes wrong. If you’re lost on the subway or unsure about anything, ask someone who doesn’t look like they’re in a rush (it might take a bit) and ask. New Yorkers don’t bite most of the time. One more thing: the subway is perfectly easy to master with the help of a transit app …and some hand sanitizer, so don’t be afraid to take the subway around while you’re in New York. The subway is the best way to get around New York City. Onwards to your touristy cheat sheet for the New York City subway. Figure out where you are and where you’re going via a NYC transit app. Check which direction of the train that you need first. MANY public transit systems allow you to switch directions if you mess up. Going towards Times Square from the Village, but realizing that you’re waiting for the wrong train? It’s best to buy a reloadable metrocard. A single-use is a rip-off and you need to pay $1 extra for every extra metrocard you buy beyond your first one, so don’t lose it. I recommend one Metrocard per adult/teen. The subway costs $2.75 (2018 prices), so use the machines in the subway station to add money to your Metrocard via a credit/debit card. It’s best to do this not during rush hour. Put your wallet away and leave the Metrocard out. Depending on the station, you’ll see turnstiles near your waist OR really high rotating gates. Don’t swipe your Metrocard too fast or too slow. (Watch people first before if you’re not sure). Don’t push immediately while swiping and if it’s not working after three tries, try a different turnstile and let other people go through. Sometimes it’s the turnstile. If you’re in a wheelchair, with a stroller, or with a family, ask an employee (in the booth) to open the gate for you. Just do it. Cheating the system is a bad idea. You might need to walk 15+ minutes to get to your platform if it’s a major station. Once there, look for the subway direction you need. Before you get on the train, CHECK if it’s a local train or an express train that skips most stops. Wait for your train and let people get out before you push on. You don’t need to swipe out, but just exit the subway station (typically through gates). The hardest decision of your day will be figuring out where to eat and which subway exit to go out of. (The second part: it doesn’t matter much and it’s easier to find your way once you’ve left the subway station and you’re above ground). What do the NYC subway directions mean?! WHAT IS UPTOWN AND DOWNTOWN? You’re probably staying mostly in Manhattan, however remember that Manhattan has a grid imposed on it. The streets are horizontal and the avenues are vertical on the map below (for Manhattan). From ANY point that you want to go North, you’re going uptown. So if you’re on 42nd street in Times Square (the red dot) and you want to go to 59th street? You’re going UPTOWN.From any point that you want to go South, you’re going downtown (e.g. 42nd street to 14th street). Sometimes you’ll see that the subway direction is UPTOWN & THE BRONX or UPTOWN & QUEENS. This means the train is still going uptown, but if you stay on that subway train, you’re going to end up in the Bronx or Queens. The same logic applies to DOWNTOWN & BROOKLYN. If you stay on the train, you’re going to Brooklyn. Simply, the direction matters; the final destination doesn’t as long as it stops off at your stop. Express Train v. Local Train!? If you’re about to catch the subway, you might accidentally end up on an express train, which skips most of the non-major subway stops. If you’re looking at an NYC subway map, keep an eye out for the white circles, which are express AND local stops. This means that both express and local trains stop here. Typically, these are transfer points, so if you miss your stop, try to pick a transfer point to switch directions in. Some smaller stations require you to exit to switch directions while bigger stations allow you to just to walk over to the downtown direction. If it’s a black circle, it’s a local stop and express trains will skip this stop. I recommend taking the local train until you get the hang of the New York City Subway. Once you do, enjoy getting around more easily! Get a Metrocard and don’t lose it ($1 + all the money you had). The New York City subway fare costs $2.75 (2018). Your NYC subway fare includes MTA buses and the subway. The New York City Metrocard does not include New Jersey Transit, the Long Island Railroad, the Airtrain (JFK), or MetroNorth. If you’re coming from JFK airport, you’ll need to pay the extra $5 fee for the Airtrain. 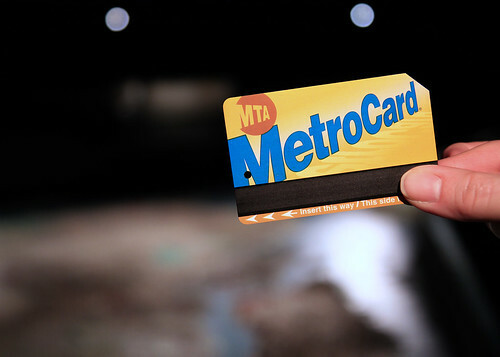 Your Metrocard swipe is valid for two hours for transfers to buses from the subway, bus to bus, OR bus to subway. Basically, if you want to take advantage of this, you need to take a bus at some point. If you want more bang for your buck and you’re planning on just stopping off for a few minutes before heading somewhere else, take the bus to your next destination after getting off the subway. As long as you’re within the two hour period, your journey will be free. In theory, you can spend the WHOLE day on the subway as it does not track when you exit the subway. Parents swipe first and young kids are free! Up to three children under 44 inches (111cm) get on the NYC subway for free every single time. They can just duck underneath the turnstile and/or you can ask an employee to open the gate for you all (especially if you have a stroller). So, if you’re a family of 4 with two young kids, you only need two unlimited Metrocards. If you’re in NYC for more than 4 days, I recommend the NYC unlimited week subway pass for $32.00, which gives you unlimited subway rides for 7 days. 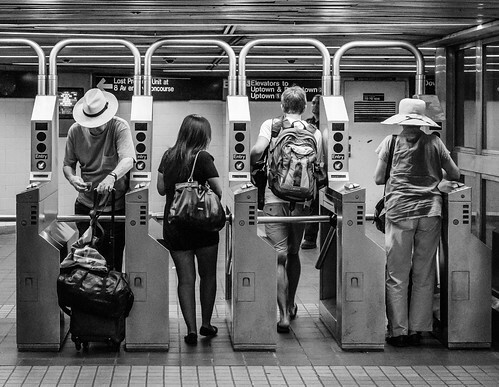 If you swipe with an unlimited Metrocard, it’s 18 minutes until you can swipe your card again. You can save a little by putting the perfect amount on your Metrocard to get a bonus if you’re into life hacks. $19.05 gets you 6 subway rides without the $1 fee for a Metrocard. Any amount of $5.50 or more added to your Metrocard gives you a bonus. Listening for the stops is kind of terrible as the speakers sometimes make it just sound like garbled nonsense and if you’re not used to a strong New York accent… It’s best to have an alternate method. I recommend to count how many stops you’ll be on that train and know the name of the stop 1 or 2 before yours. Then you’ll be ready to get off the train and next to the doors just in time for the closing doors! LET PEOPLE GET OFF THE TRAIN BEFORE YOU GET ON. Trust me, you will get anywhere faster if you block the exits. Don’t stare directly at people and if someone catches you, look away quickly. We ALL stare at others on public transit, but be subtle. Don’t talk to people unless it’s to verify it’s your stop. Most people commuting are just tired or in a rush. I promise New Yorkers aren’t rude most of the time, but sometimes we’re just tired after commuting 1.5 hours one-way to work and not in the mood to chat. Don’t get in an empty car, especially on a crowded train. Wondering why it’s empty? Once, it was because it was basically a biohazard. Another time, the air conditioning was out and it was summer. Don’t put your bags on a chair that someone can sit on. Don’t man-spread (aka spread your legs so much that it takes up 2 seats). Don’t wear your backpack on the subway, especially on a crowded train. You’ll be banging into people, so take it off and put it in between your legs to minimize space. Keep an eye on your stuff. Pickpocketing isn’t a huge issue in New York, but it happens. I still think it’s good to keep an eye on your stuff and keep it close to you, even just to ensure you don’t leave anything on the train. If there’s a bunch of seats free, don’t sit next to someone. I think this is pretty standard public transportation logic, but well, doesn’t hurt to repeat it. Hold onto the railing. Seriously, it’s really annoying when someone doesn’t understand that the subways move a lot and they’re falling into everyone around them. It takes time to learn how not to move when the subway jots. If your swiping is not going well, let the person behind you go ahead. The machine is probably fine; your swipe speed is probably not. Keep your metrocard loaded up if you have a busy day ahead. It’s best to do this NOT during Rush Hour. Don’t eat on the train and don’t carry coffee unless it’s in a secure container. It’s one thing to drink your morning coffee in a secure container that is spill-proof….but come on people. Nobody wants to have your BBQ or hot coffee spilled on them. It’s rude and get a granola bar. Give your seat up for the elderly and the pregnant. Manners matter. Don’t get in JUST as the doors are closing if you can. It holds up the WHOLE train and you don’t want your fingers getting caught! Don’t play in the tracks and stay away from the edge until the train comes. People die this way as the third rail is deadly. Don’t carry your luggage during rush hour. It’s going to be really tough to get on the train with a huge suitcase when everyone else is packed as sardines. Have your metrocard ready! Don’t make other people wait for you! Avoid the doors if you’re not getting off soon. Unless you’re ready to be pushed as people try to enter/exit, only get near the doors if the train is full OR you’re about to get off. Don’t stop in the middle of the station, especially during rush hour. Nobody will be expecting you to stop to take photos, so you’ll be pushed. Plan properly for a transfer. Some transfers can take up to 20 minutes as the station is so HUGE. Wash your hands after you leave the subway before you touch your face or eat anything. Let’s not talk about the research into the germs found on subway handrails. Don’t take out your giant subway map. Check the one in the station OR on the train. Just save the official MTA subway map on your phone. What happens when the NYC subway isn’t working due to construction or delays? Service changes are a MAJOR issue, especially on nights and weekends. The MTA does most of their construction then, so you’ll sometimes encounter stuff like, “This F train is running the A track until X destination” as the tracks normally available aren’t working. Instead of the train stopping off at its normal stops, it will function as if it’s an A train instead of an F train. Annoying and confusing, right? As much as I love Google Maps, it’s not great for various service changes with the NYC Subway for now. As a result, it’s really best to have a good NYC Transit App installed on your phone before you go. You can check the signage in the subway, but that’s more of a desperation move for when you realize that the train isn’t coming as you need to go to a totally different track (e.g. go to the express train track instead of the local) to get your train. Usually people will give you a heads-up. That said, Google Maps does the job well 90% of the time, but I recommend having a back-up if you see a sign that there’s construction on the line that you’ll be taking every day. I find that Citymapper and Transit are your best options for New York City subway apps.I think that Citymapper is pretty good for tourists as it allows you to see a HQ version of the subway map, so if you’re just trying to figure WHERE you’re going even when you’re not sure. Transit is super simple to use and incorporates all the subway construction/delays into its easy-to-use interface, so follow the app. Apparently the most confusing things for many first time tourists is how to how to get from JFK to Manhattan using public transit. As soon as you exit JFK, follow the signs towards the Airtrain. Go to the booth and get your combined Airtrain + Subway ticket. (The Airtrain costs $5 per way). Take the Airtrain towards Jamaica Station. At this point, get on the E train towards Manhattan or the A train towards Brooklyn and Manhattan. The E is faster if you’re going to midtown Manhattan, but it depends on your destination. From JFK Terminal 2 to Times Square, it will take about hour. Voila you got it, $7.75 to get from from JFK to Manhattan by subway. Save that cab money for good food. Sidenote: My favorite subway is is the above ground part of the N (in Astoria) and the 7 (when it’s working) as you see so many neighborhoods from the window. Similarly, I love the above ground part as you cross from Queens into Manhattan. Enjoyed this? I have more helpful articles about New York City, including the perfect itinerary for five days in New York City, tips for visiting NYC on a budget, NYC for Christmas/the holidays, what to wear in New York for every season, and assorted insider tips for New York City. 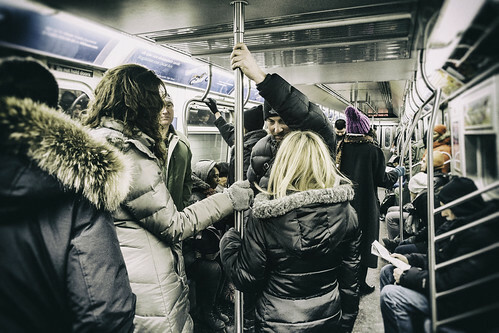 Have you taken the New York City Subway? Any questions? As a native New Yorker reading this was quite entertaining. And even though the subway comes naturally to me, there are actually quite a lot of things to be aware of! But it’s definitely the easiest way to get around the city – unless, sadly, you’re in a wheelchair or have mobility issues. Although I also love the bus and recommend a ride on it at some point during your stay. You get to see the city while you get to your destination. Great guide and tips (and a lot of them made me laugh)! Great tips. I’ve been there with trouble swiping. Love that your grandfather rode the subways so much. Thanks for the tips. How to get from JFK to Queens? JFK is in Queens. I don’t know where you’re going, but take the Airtrain to Jamaica Station and see what Google Maps tells you to do! You’ll probably end up taking another bus or train from Jamaica.